Messiaen spent eight years creating Saint Francois d’Assise, his only opera and one he probably understood that (for an host of reasons) would prove something of a trial for both performer and audience. But, man of faith that he was, he also must have sensed that, for anyone willing to go along with him for the ride (and it is as inexorable one as any I've been on) - there is much to love, and yes, rejoice in. Now, after 25 years, the work has finally made it onto commercial video and the three disc set for OpusArte could not be more welcome than they are right now. In the title role, Rod Gilfry provides his own miracle. It is one of the greatest assumptions of a role I can recall witnessing. I never once felt Gilfry to be playing Francois so much as inhabiting entirely Messiaen’s vision of the beloved saint, and making him his own. While other Francois (including Jose van Dam, the creator of the role) have been equally firm of voice and capable of singing this remarkably difficult music, Gilfry crosses a line they did not. Into this often austere music, he injects a Francois as full of joy as he is contemplation and seeking, his face a remarkable mask, mirroring seemingly endless expressions – not one of them false or forced. Through voice and visage he practically "beams" Saint Francis out to us. Firm of tone, equal in almost all registers, Gilfry’s delivery of Messiaen’s own text mixes the "matter of fact" declamation of his predecessors, tempered with a beauty of sound combining elegance with great emotion. I believed in Francois and his journey . . . in his every effort to humble himself to the greatest degree possible, to rid himself of every fear and doubt so as to be brought closer to his God. It is a remarkable journey. We see his first weakness when, to his great embarrassment he admits his repulsion for lepers. He prays God to purify him . . . change him, so he may learn to love the lepers. That prayer is answered by the arrival of the pathetic, suffering Leper to whom Francois immediately offers comfort and peace to. While The Leper howls of his pain, Francois shares how suffering is a trial so we may, in some small way, comprehend the suffering of Christ, making His sacrifice and love all the greater. The Leper continues, sharing the suffering he endures at the hands of other monks. 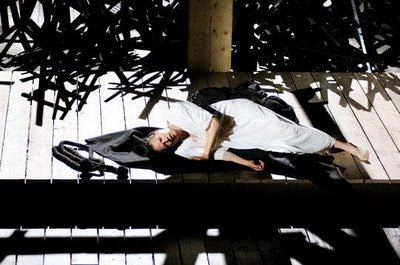 The Angel (Camilla Tilling) appears from high above the stage, her pure and gentle message: God loves him. Francois interprets the Angel’s message for him: Your sorrow is in your heart, and God is far greater than your heart." Here is some of the score’s first, "traditionally" beautiful music and Messiaen could not possibly have used it to finer effect – the result is overwhelming. The Leper thanks Francois for his kindness but Francois admits, "I have not loved you enough" and, raising the diseased wretch’s head to his own, kisses him, encircling him in his arms. Here, Gilfry's face radiates pure love and tears well in his eyes – and suddenly: The Leper is healed. I found myself so completely overwhelmed a break was necessary before continuing with Act II. Though Act II runs just shy of two hours, its three scenes played out almost before I realized they were over. The first two scenes are dominated by the presence of The Journeying Angel and his interactions – dazzling and beautiful – with Frères Massée, Elie and Francois. 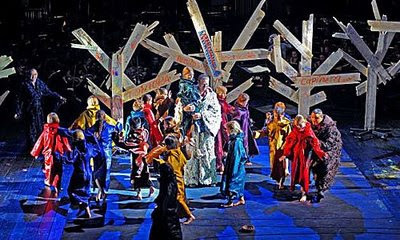 The 3rd scene (Tableau 5) is the famous "sermon to the birds" and here the stage becomes filled with color, children, puppets on a set filled with crudely made trees of 2X4s on which Frères Massée, Francois and the children write the names of (and draw) the birds of which they sing. The children take to some fanciful street art which later creates a magical special effect at the end of the scene. Director Pierre Audi sets the massive stage alive - placing the enormous Hague Philharmonic center stage, set among acres of scaffolding, platforms and an enormous open dome above the stage from which the chorus sometimes sings, (and which fills magically with stars upon Francois' death). Stacks of of wooden crosses separate the orchestra from the central playing area, a raised platform between all the scaffolding. Angelo Figus' costumes are elaborate takes on ancient liturgical looking robes, of stunning yet crude construction and looking of skins and feathers. Each Monk’s is rich with color, tied with wrist-thick ropes and envelop each brother like a living sarcophagus. Upon receiving his stigmata, and in preparation for his death, the barefoot Francois sheds his final robe (rich, black) to finish the "opera" clad only in a simple white gown, symbolic of his attainment of grace and purity. It’s a simple, yet powerful effect. As a great fan of Tom Randle. it was especially nice to see him cast in the important role of Frères Massée, injecting (along with the children) a bit of levity into some otherwise very lofty proceedings. His voice still marvelously expressive and he remains (for me) one of the very best actors to be found in opera. Not as beautiful of voice as Randle, but also marvelously expressive is Hubert Delamboye as The Leper. 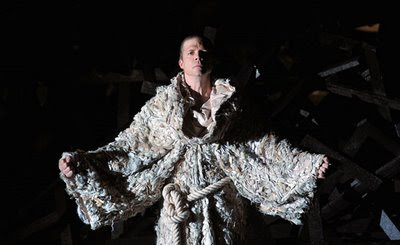 His transformation scene is powerful and the sense of joy shared by him and Francois upon it one of the opera’s most powerful and emotional scenes. Smooth voiced, Henk Neven is affecting as Frère Léon, as is Donald Kaasch Frère Elie (if a bit wide of vibrato). Maestro Ingo Metzmacher does the near impossible keeping together the massive forces of the cast, the Hague Philharmonic and De Nederlandse Opera Chorus in what can only be deemed as an absolutely thrilling reading of Messiaen’s magnum opus. The wildly divergent sounds they are required to achieve – muscular, bold, provocative come through loud and clear, but they also provide many moments of truly rapturous beauty. This is evident nowhere more so than the final chorus, - staged magnificently. As Francois "disappears" the chorus rises to the front, like witnesses of a medieval pageant – but also providing the voice of God – as a blazing, golden light suffuses everything, and the stars twinkle above all through the dome – a window to heaven – in what is perhaps the loudest crescendo in all of western music. The effect created here is truly otherworldly. breathtaking and sui generis – feeling both like a coupe de theatre - and a holy rite. I must again single out Rod Gilfry’s performance. Onstage for four plus hours (and in all but one scene) he provides consistently beautiful singing, a commitment and intensity that is – from start to finish – nothing short of remarkable. He IS Francois.